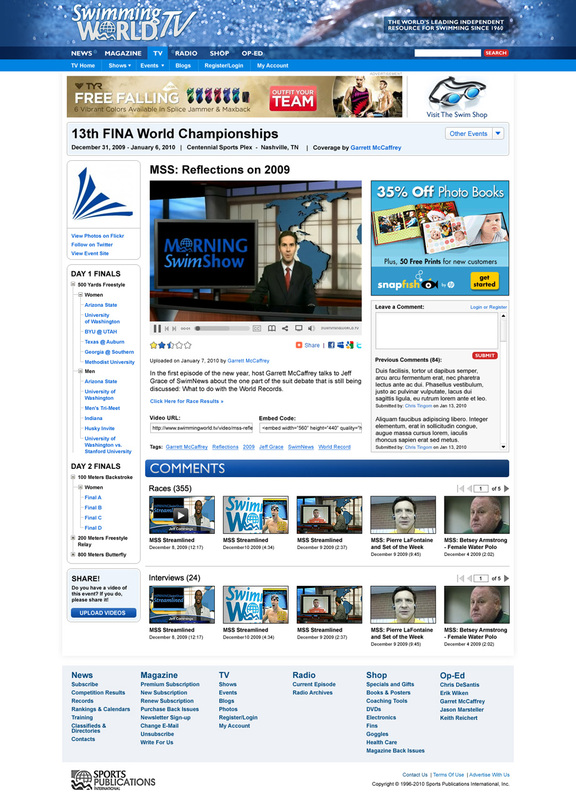 We began by designing the TV section of the Swimming World web site, with the intention that the design would be integrated across the entire web site. We created a custom header design and navigation design that was flexible and could be integrated on multiple platforms. You can see the pagination system live and in action over on the Swimming World TV web site. The site has over 20,000 videos and receives a considerable amount of traffic. We also later on developed a mobile version of the web site and provided customized designs for sub pages. The web site earns almost all of its revenue from ad placements and optimizing the ad positions and ensuring they were well positioned in the design was critical. Our team also integrated with the Blip.tv video upload API so that new videos automatically are added to Blip.tv which runs additional advertising.